The Star Wars: The Mandalorian TV show got enough new information to satiate a sarlacc's appetite (if they ate knowledge instead of people) at its very own dedicated Star Wars Celebration 2019 panel. Folks from both behind and in front of the camera took the stage to tell us about how the very first Star Wars live-action television series is taking shape, and they even teased their audience with the show's first proper trailer. Not only that, we now know when the Star Wars: The Mandalorian TV show release date will fall: November 12, 2019, the same day that the Disney+ streaming service (where it will be exclusively available) is scheduled to go online. The Star Wars: The Mandalorian release date is November 12, 2019, which makes it a launch title for the upcoming Disney+ streaming service. That means you'll be able to start watching it over a month before Star Wars 9 closes out the Skywalker saga on December 19, 2019. Sounds like a pretty good way to pass the time! A Star Wars: The Mandalorian trailer has been seen by the public, but unfortunately it was a convention exclusive for attendees of Celebration. Still, there's no rule against describing it: the Star Wars: The Mandalorian trailer started with the titular gunslinger following what appeared to be a tracking beacon across the surface of an icy planet. He found his way to a cantina (appointed in the familiar Mos Eisley style) full of aliens who looked none-too-pleased about his arrival. The Star Wars: The Mandalorian trailer then pulled out to more behind-the-scenes footage and interviews with the cast and crew. One piece of art showed The Mandalorian riding a dewback, giant lizards that are native to Tatooine, so it looks like he'll be spending some time on the Skywalkers' homeworld. It will be interesting to see what the underworld of Tatooine looks like five years after the death of its criminal kingpin, Jabba the Hutt. It’s official. The Star Wars website has confirmed that the Star Wars: The Mandalorian cast will be led by Pedro Pascal – a man so charismatic as Oberyn Martell in Game of Thrones that it seems a waste to hide his head behind a helmet, even one as cool as the Mandalorian’s. He’ll play the mysterious lone gunfighter of the title. Former MMA champ Gina Carano plays Cara Dune, an ex-rebel shocktrooper who is having trouble re-integrating into society after her experiences in the war - easy to see how her path might cross with our gunslinging hero. And Carl Weathers (you know, Apollo Creed) plays a fixer named Greef who hires The Mandalorian to receive a certain valuable item for a certain rich client. The Mandalorian TV show will also feature Giancarlo Esposito, aka Breaking Bad’s biggest bad Gus Fring; Emily Swallow (Amara in Supernatural); and Omid Abtahi (Salim in American Gods). Not to mention Nick Nolte, and even the legendary director of Fitzcarraldo and Grizzly Man (and sometime actor) Werner Herzog is on board – now that’s a bit of leftfield, unexpected casting. The Star Wars: The Mandalorian story will focus on a masked “lone gunfighter” who – like famous bounty hunters Boba Fett and his dad, Jango Fett – chooses to wear the iconic battle armor of the Mandalorians. In Star Wars canon, it’s the look that inspired the armor of the original Clone Troopers in Attack of the Clones, the DNA of which can be seen in all the subsequent Republic/Imperial Trooper suits. Beyond being known as “The Mandalorian”, we know nothing about the identity of the owner of the Mandalorian armor – aside from the fact he's the spitting image of Oberyn Martell from Game of Thrones. Of course, that hasn’t stopped the internet from speculating. I certainly wouldn’t be surprised if it’s a character we’ve encountered elsewhere in the Star Wars saga, even in a minor role, simply because Lucasfilm’s Story Group (arbiters of Star Wars canon) has form for it – the Rebel insurgent in Rogue One didn’t have to be Onderon freedom fighter Saw Gerrera from Star Wars: The Clone Wars with two more decades on the clock, but it helped tie things together, the same way Darth Maul’s surprise cameo did in Solo. One candidate for the suit’s owner is Cobb Vanth, a character in Chuck Wendig’s post-Return of the Jedi Aftermath trilogy of novels, who crops up in Boba Fett-style togs on Tatooine. It could even be Boba Fett himself. Yes, I know the last we saw of him was his malfunctioning rocket pack blasting him towards a thousand years of misery being slowly digested in the Sarlacc’s belly. But there’s no reason a warrior as skilled as Fett couldn’t make his escape – indeed, he’s done it before, having forced his way out in the old Expanded Universe “Legends” novels that are now expunged from official continuity. There are good reasons to suspect Fett’s repeated the trick in the official Star Wars timeline, too. The first Aftermath novel references Mandalorian armor found on Tatooine, “pitted and pocked, as if with some kind of acid” – a description consistent with someone who’s had a close encounter with a giant creature’s digestive tract. (Though obviously the pristine suit revealed in the first The Mandalorian TV show image suggests he’d have since upgraded.) Meanwhile, Pablo Hidalgo, of the Story Group, told a Star Wars Celebration panel that “Boba Fett is both simultaneously alive and dead in the Sarlacc” until someone writes an official story that makes the call either way. I reckon Fett’s an unlikely candidate, however. Even accepting that spoiler-phobic showrunners and directors are prone to fibs from time to time, the fact that Favreau told Nerdist that Star Wars: The Mandalorian will feature “all new characters [and] different planets,” seems to remove the bounty hunter from the running. Also, the fact that, until recently, Lucasfilm were developing a standalone Boba Fett movie (with Josh Trank and James Mangold both attached as directors along the way) would seem to take him out of the running – Fett may be a fan favourite, but not enough to carry his own movie and a TV show. The Mandalorian TV show takes place five years after Return of the Jedi. In the official Star Wars chronology, that means that the New Republic has defeated the Empire for the last time, Mon Mothma has signed the “Galactic Concordance” (a kind of cosmic peace treaty), and the remnants of the Imperial top brass have travelled through the ‘Unknown Regions’ of the galaxy to start the First Order. Obviously we’ll hear from those guys later, but at this point in the Star Wars chronology, that galaxy far, far away is in a state of flux – and with some three decades to go until the events of The Force Awakens, there’s a lot of unexplored territory for the show’s writers to get their teeth into. Star Wars: The Mandalorian also finds itself in a wonderfully rich time period for a space Western on the fringes of the Star Wars galaxy. After all, it’s safe to assume that the New Republic (born from the Rebel Alliance) hasn’t had much time to bring stability to a post-Emperor universe - creating the sort of lawless vacuum that bounty hunters, gangsters, and smugglers (my kind of scum) love to exploit. Indeed, it’s the sort of fertile criminal territory Lucasfilm considered exploring before the Disney buyout in 2012 – both with aborted TV series Star Wars: Underworld (which would have been set between Revenge of the Sith and A New Hope), and similarly discarded Coruscant-set video game Star Wars 1313. 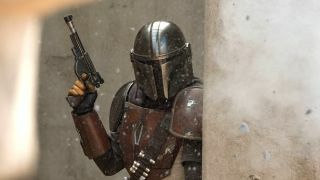 The Star Wars: The Mandalorian TV show’s time period also makes rumors about Star Wars Rebels’ resident Mando warrior Sabine Wren making an appearance plausible. Making Star Wars has reported that her characteristic helmet has been spotted in the production, and seeing as we know from the Rebels finale that Sabine is still very much in action after the Battle of Endor, it's not much of a stretch to say that she'd still be active a few years later. Fingers crossed she makes it into the show, because she was one of Rebels’ standout characters – and an instant cosplay icon. The race who give The Mandalorian TV show its name hail from the planet Mandalore. A people with a war-mongering history, they come armed with the sort of wonderful toys (jetpacks, flamethrowers, rocket launchers) that would make Batman jealous. A unique lightsaber known as the ‘darksaber’ – created by the first ever Mandalorian inducted to the Jedi Order – is a key symbol for unifying the Mandalorian people. While their appearances in the Star Wars movies have been limited to the Fett family (and a crest flying outside Maz Kanata’s castle in The Force Awakens), the Mandalorians have been key players in both the Star Wars: The Clone Wars and Star Wars Rebels animated shows. In The Clone Wars, the peaceful New Mandalorian government run by Duchess Satine Kryze (Obi-Wan Kenobi’s ex) is overthrown and subsequently assassinated in a coup by the militant Black Watch, a terrorist cell of ex-soldiers who yearn for a return to their race’s militaristic past. Former Sith Lord Maul ultimately seizes control of the planet, until future Emperor Darth Sidious eliminates the threat of his spiky former apprentice in person. Come the time of the Empire in Star Wars Rebels, Mandalore is under Imperial occupation, with its various clans split between those loyal to and opposed to the Empire. They are ultimately united under Satine Kryze’s sister, Bo-Katan, when she gets to wield the ceremonial darksaber. That said, we have no reason to assume the eponymous star of the Star Wars: The Mandalorian TV show is Mandalorian themselves. They could simply have stolen someone else’s armor – and with all that lethal hardware on them, would you ask them where they got it? so rich in facts that Solo co-writer Jon Kasdan admits he used it extensively in researching the movie), the Mandalorian armor has a long history and was constructed to help its wearers fight with Jedi in a generation-spanning war. Various different styles of armor evolved over the years, including a red and black version with a horned helmet inspired by Maul, during his brief time in control of the Mandalorian government. Mandalorians loyal to the Empire also gave their suits a Stormtrooper-like makeover – which effectively brought the design full circle, seeing as the the original Clone Trooper outfits were inspired by Jango Fett’s own Mandalorian armor. Some individual wearers also chose to customise their suits further: Sabine Wren covered hers in colorful graffiti-like designs, while bounty hunter Boba Fett adorned his with braids of hair as trophies commemorating his biggest catches – the old Legends continuity claimed they belonged to captured Wookiees. Indeed, another rumor from Making Star Wars suggests that the hero/antihero/whatever of The Mandalorian TV show is similarly keen on upgrading his Mandalorian armor. They report that there could be a woman in a "secret Mandalorian enclave" who, like Q from James Bond, keeps him furnished with new toys and hardware that help him "evolve" his suit. Why? Let's just say the Mandalorian armor is about more than fashion. It's made of a metal strong enough to repel blasters, and is generally loaded with enough weaponry to make its wearer into a one-person army. The iconic helmet contains various HUDs to help with tactics, while the suit itself is packed with optional extras. The jetpack, for example, allows for short bursts of aerial combat, while some versions contain a rocket launcher – a potentially dangerous weapon for its user, seeing as careless use could blow their heads off. The ‘vambraces’ on the wrists are arguably the trump cards in the Mandalorian armor, however, seeing as they can contain anything from flamethrowers and blasters, whipcord throwers (as used by Boba Fett to tie up Luke Skywalker in Return of the Jedi) to more primitive blades and darts. As previously stated, Jon Favreau is the creator and showrunner of The Mandalorian TV show. Aside from being the successful director of Iron Man and Iron Man 2, Elf, The Jungle Book and, er, Cowboys and Aliens, Favreau already has history with a galaxy far, far away. He played four-armed Ardennian pilot Rio Durant in Solo, and even has a Mandalorian on his filmography, having voiced Death Watch leader Pre Vizsla in The Clone Wars. The team of directors on the series is just as impressive. For die-hard Star Wars fans the most exciting member of the team is probably Dave Filoni, the walking Star Wars encyclopedia who oversaw both The Clone Wars and Rebels. Having stepped back from the day-to-day on new animated show Star Wars Resistance, he’s making his live-action debut with the first episode of The Mandalorian TV show. Other directors on the series include Jurassic World star Bryce Dallas Howard, Deborah Chow (Jessica Jones, Lost in Space, Better Call Saul), Rick Famuyiwa (Dope), and Thor: Ragnarok helmer Taika Waititi – can he find a way to transport Korg over from the MCU? Star Wars: The Mandalorian has also signed up an A-list composer to soundtrack the show, in the form of Ludwig Göransson – who's just picked up an Oscar nomination for his work for Star Wars’ Disney stablemates Marvel on Black Panther. Favreau revealed the above painful-looking rifle, which bears a striking resemblance to a weapon Boba Fett carried in his very first screen appearance – in an animated segment of 1978’s much-derided Star Wars Holiday Special. Anyone for ice cream? The above image may not look like much, but it’s got it where it counts – in Star Wars terms, at least. A similar device was seen in Star Wars: The Empire Strikes Back, being carried by some random guy in the evacuation of Bespin. Despite appearing on screen for mere seconds, he became an unlikely cult hero known as the Ice Cream Man because his device resembled an ice cream maker. He’s since been written into continuity as Willrow Hood. As a Star Wars: The Mandalorian Christmas treat, Favreau released this above photo of a droid who looks uncannily like IG-88 – one of the six bounty hunters Darth Vader unleashes to track down Han Solo in The Empire Strikes Back. There are also rumors of an appearance by reptilian bounty hunter Bossk, and who knows, maybe there’ll also be cameos from 4-LOM, Zuckuss, and Dengar (who was voiced by Simon Pegg in the Clone Wars series). Meanwhile, The Mandalorian TV show’s leading man showed off the above fantastic sketches from director and former Clone Wars/Rebels showrunner Dave Filoni – loving that cape! See what other Star Wars-shaped things are on the way with our guide to all the new Star Wars movies coming to a galaxy near you. Or see how it all fits together with our video rundown of the Star Wars timeline.